Uncommon Japanese map of the world. 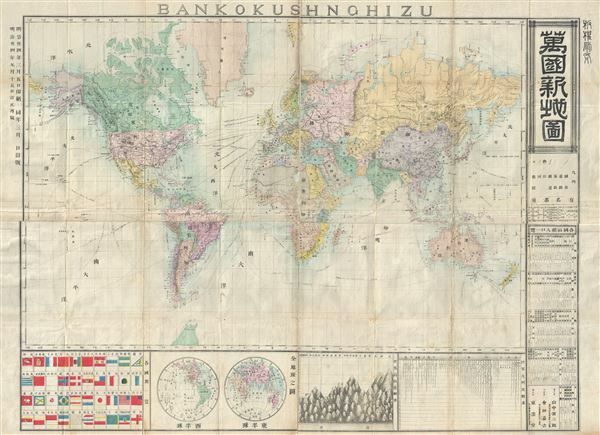 An uncommon 1881 (Meiji 14) Japanese map of the world by Yamanaka Zensaburo. This map, clearly derived from European sources, illustrates the world on Mercator's projection. The routes of various explorer as well as oceanic trade routes are noted throughout. Along the bottom and right hand sides of the map there is a wealth of information that includes important flags, hemisphere maps, comparative charts illustrating mountains and rivers, and distances tables. The presence of English text at the top of the map is indicative of Japan's opening to the world under the Meiji Restoration. Very good. Some Japanese style repair on original centerfold.